The Faculty of Humanities launched its doctoral programs after the introduction of PhD degree programs in Hungary in 1993. The diversity of the subjects – we have accredited doctoral programs in all academic fields – make the Faculty a unique doctoral centre in the country. The 75 PhD programs offered at present are part of 4 larger units, known as Doctoral Schools. Proof of the exceptionally high standard of education is the ever-growing interest in our programs. Our Faculty occupies a leading position in almost all fields, and is in many cases the only institution providing a particular program not only within Hungary, but throughout Eastern Europe, and thus accounts for the development of specialists within that field in the whole region. During their PhD studies students have to collect 240 credits. The programs are divided into three larger modules. The aims of the courses are to immerse students into their specialized field of study, to endow them with the research methodology needed for an academic career, and the development of their qualities as teacher and researcher. By fulfilling the publication requirements the students become part of Hungarian and international scientific life. Since the use of international reference literature is a requirement, our students are expected to be proficient in at least two foreign languages. At the end of the second year (semesters 1-4), for finishing the training and research section, the students have to take a successful doctoral comprehensive exam to be able to proceed to the research and comprehensive section (semesters 5-8). 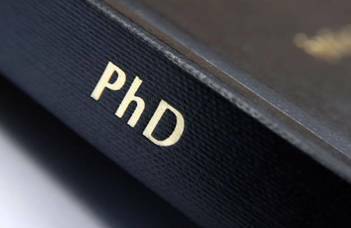 To obtain a PhD degree, the students have to defend their dissertation in a public debate 3 years after the successful comprehensive exam. The international agreements between universities and the diverse international academic relations of the supervising teachers provide outstanding students with the opportunity to partake in foreign research programs, or to complete their doctoral studies in the so-called Cotutelle form (double doctoral degree scheme). The doctoral schools frequently organize student conferences which serve as an excellent forum for talented students to present the results of their independent research, and to develop the academic skills indispensable for a future scientist. The students work on their dissertation topic under the guidance of an established member of Hungarian academic life. In these scientific workshops they become acquainted with the latest international developments in their field of study (secondary literature, methodology, research). Feedback proves that those who have obtained a PhD at our Faculty are highly trained academics with a profound knowledge of their subject areas, well-equipped to continue their research both in Hungary and abroad.